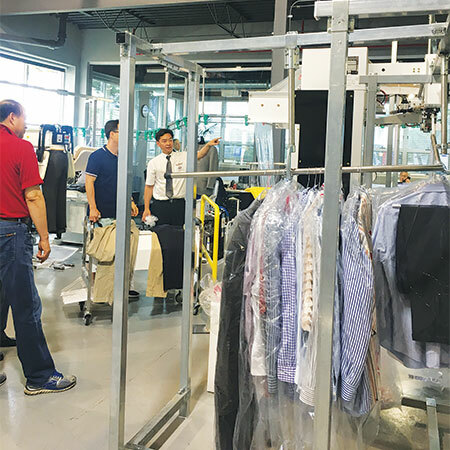 During the all-day open house celebration of Sankosha USA’s 25-year-anniversary last week, many guests checked out the company’s showroom. 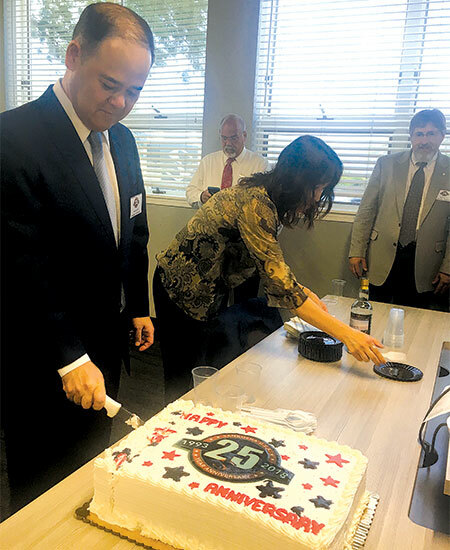 ELK GROVE VILLAGE, Ill. — Sankosha USA held its 25 year celebration here last week, with an open house and cake-cutting ceremony. I attended. The cake was delicious. The owner dreamed of taking his machines beyond Japan and expand to the United States, Odorizzi explains, but he needed to speak English and decided to take a local class in Japan. “As it turned out, Wesley Nelson, our chief operating officer and vice president of sales, who was born in Wisconsin but was living in Japan at the time, was his teacher. That’s how they first met,” Odorizzi says. Just inside the front entrance, after being warmly welcomed by company staff, each guest picked their own marker color to sign their name to a large poster commemorating the event. Cameras flashed and people clapped as the founder’s eldest son Yusuke Uchikoshi, president of Sankosha Ltd., did the honors and cut into the big, brightly-decorated cake. The event was well-attended, with guests arriving all day. The building holds the firm’s offices, parts, warehouse and a new showroom. The company also provided catered food and refreshments.